$210,000 Sparkling Clean & now Vacant! "3 Bedroom Plus 2 Bathrooms, Great Room Style"? Bedrooms: 3 "3 bedrooms are Rare for Keremeos"
Bathrooms: 2 "4 piece ensuite, 3 piece Main with walk-in shower"
So Clean, it Sparkles!! 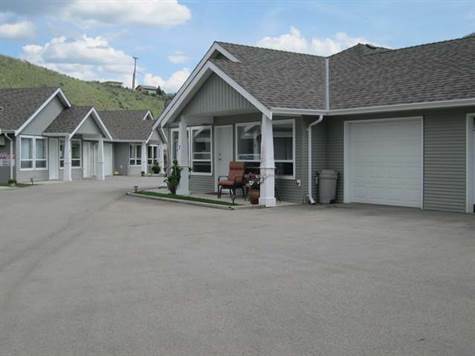 Rarely available in Keremeos is a Townhome with 3 Bedrooms! Also has 2 Full Bathrooms. Built in 2007, this 1 level, END UNIT has the popular Open Concept "Great Room" style perfect for a casual but gracious lifestyle. In addition, Mountain View Estates is the only 'gated complex' in Keremeos and it's within walking distance to grocery shopping and restaurants. Easy to view & quick occupancy can be arranged if needed. Spacious and practical U-shaped Kitchen with pull-out drawers, abundance of cupboards and counter space. Grab a bite at the eating bar or sit down for a leisurely meal at your dining table. Living room section of the Great Room has a cozy fireplace and a decor-niche above. Bank of windows across the front make all living spaces very bright. Down the hallway, you'll find the 3 Bedrooms and 2 full bathrooms. The 3 piece Main bathroom offers large walk-in shower and, it's spacious enough for those who have mobility challenges. 4 piece Master Ensuite has tub/shower combination. Laminate flooring in the Great Room and hallway, with Carpets in the Bedrooms. Parking for 2 includes a Single attached Garage with cement floor and an exterior parking space beside the home that is allocated yearly by Council. A barbeque is allowed on your rear patio. Monthly strata fee is only $166/mo. For Adults over 30. A small dog is permitted (perhaps 2) but must be approved by Council. Is perfect for snowbirds or anyone who wants a lovely, easy to maintain home with walking distance to Keremeos shops, services and restaurants.